Irresistible tangy treats dipped in ridiculously rich white chocolate. Without a doubt, these are our most popular creation. One taste and you will discover why. 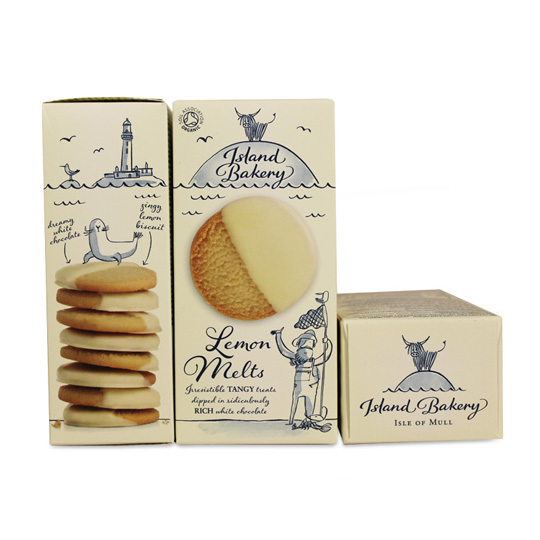 The zesty lemon biscuit is the perfect foil for the rich, sweet blanket of white chocolate, and the melt in the mouth texture adds to the joy. This item is sensitive to heat and if it's shipping to a warm destination that is more than 2 travel days away, we suggest using an expedited ship method. We have not opened the cookies as yet, they are a Christmas gift. But we must say they did arrive much quicker then expected. We have had the cookies thought on a British Air flight, they were great! My wife and I had these lemon melt biscuits on a plane trip from NY to Scotland earlier this year. We both could not stop thinking about them, wanting to find them when we got back in the U.S. I spent the entire trip to the U.K. completely pre-occupied with getting my hands on more of these things. They are more addictive than crack, more delicious than Nutella or craft beer, and more difficult to come by than an honest politician. I would auction my right kidney to buy these if I had to. We need more. Make more. Make them more available. We must have more. Seriously. Get to work. Make much, much more. I searched all over for these cookies after tasting them in Scotland. You delivered them quickly and in perfect condition. I'll be back! These cookies were provided in a pack of two on a British Airways flight to Scotland I took two years ago. Spent the trip trying to locate them. Returned to Scotland again last year and waited two days for Elephants in the Pantry in Grantown-On-Spey to get some in stock. Bought most of what they got delivered to bring back home. These cookies are extraordinarily good. The perfect blend of crunchy and smooth as well as lemon and white chocolate. Once you have tried them, you will become obsessed with finding more. We buy a specific imported treat from CMB. We are impressed with the care they take to insure our delicate product arrives quickly and in great shape. CMB really does care about the end result and we appreciate it! Finally I found you !! I had these 2 yrs ago on a British airways flight from NY to Berlin. I couldn't believe how great they are. I've searched high and low state side to find these. It was easy to order on this site. Thank you guys for supplying the best cookies ever.